Online paint color visualizer programs can be very helpful for finding the ideal paint color for any room in your home. Many of the online tools are simple to use and allow you to upload a picture of your own room and add the paint color you want. You can try different colors to see how your room will look without having to mess with samples, or test painting a portion of the wall. Below we’ve listed some of the best free paint color visualizers that are currently available. 1) Sherman-Williams Color Snap Visualizer – Sherman-Williams, one of the world’s largest producers of paints and coatings, has the Color Snap Visualizer. This allows you to play with and select colors from Sherman-Williams collection. Upload a room photo or select a “scene” from a gallery of room photos. Select the colors you want to use for specific areas of the room in three ways: digital color wall – which has all the shades of Sherman-Williams paint you would want; the color collections – a gallery of different color schemes; or the match photo function –select colors from a photo and match them to existing paint colors. 2) Benjamin Moore Personal Color Viewer – The Personal Color Viewer from Benjamin Moore allows you to see what the companies different paint colors would look like in your space. You can upload a room photo or select a sample room design. There are samples of bathroom, bedroom, dining room, energy way, home office, kid’s rooms, kitchens, living rooms and exteriors. You then create up to 5 zones in your selected image that you want to paint. Select paint colors by browsing the color database. If you know what Benjamin Moore paint you’re looking for, the database can also be searched by either paint name or number. 3) Behr’s Color Smart Tool – Behr’s Color Smart tool focuses and starts with color schemes. The tool offers you a choice of coordinated color palettes; just choose the main color and then the program will select and present you with a set of pallets featuring that color and three other coordinating colors. 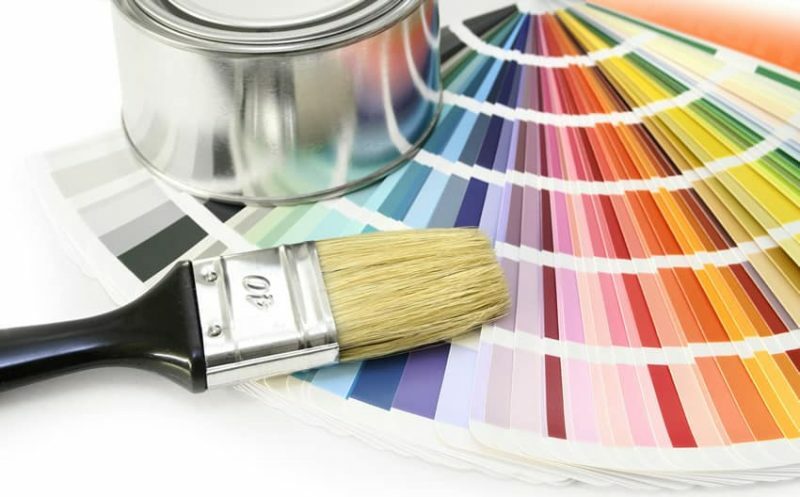 Colors are presented by color family, decorator style, and popularity. After choosing your coordinated palette, you need to choose a room design and an image of the room using your selected color palette will be shown. The room designs you can choose from include bedrooms, bathrooms, living rooms, kitchens, dining rooms, exteriors and others. 4) Cloverdale Paint Visualize Software – Cloverdale Paint offers a color visualize software that allows you to see how your finished paint project will look before you even begin to paint. To use, you need to take a “before” photo of the room to be painted and upload it onto the tool’s website. Then, pick a color and click on the area you want to paint in that color. There is a lightening tool by which you can change the shade of paint that you used. You can save and share the painted room via Facebook, Twitter or E-mail or by printing and downloading. 5) Rodda Paint Color Tool – On its website, Rodda Paint offers a color visualize with which you can play around with various combination and shades of Rodda Paint’s to help you decide which colors you might want to use during your paint project. The tool allows you to choose from Rodda’s multiple color systems to come up with your own ideal palette. You can apply paint shades and finishes to the walls and ceilings and floors, also– depending on the room design you choose – other areas such as trim, baseboards, and crown molding. Aside from paint shades, the tool also allows you to apply flooring products. 6) Gildden’s Room Visualizer – Gildden’s Room Visualizer tool allows you to pick which colors from their collection will be good in your rooms. You can either upload your own photo of your own room or pick from a collection of rooms. An interesting feature of this particular tool is it helps you pick a color scheme or palette for your rooms. When you make a color selection, the program won’t just tell you what the paint shade is called, it will also give you complimentary color and shade suggestions. 7) Valspar’s Painter – Valspar’s Painter is a tool that can let you see how different colors will look in both your interior and exterior spaces. You can either choose a photo of a room from their photo libraries or load a photo of your own. The galleries of rooms available are classified according to room type and style so you can better match the photos to your own home. The colors that you can choose to use are arranged by color families, you choose the individual swatches of color you want to use and can see them in the images. 8) Olympic Paint Color Visualizer – Olympic Paint Color Visualizer allows you to explore their colors and digitally paint rooms with them. Colors can be browsed according to color family or through color collections which are designer-inspired and chosen pallets. 9) McCormick Paint’s Color Visualizer – McCormick Paint’s Color Visualizer allows you to paint either a pre-selected home interior photo or photos of your own home. Try out the different colors of McCormick Paints in different color combinations to see what your room would look like with those paints. The gallery contains a variety of room designs which you can paint in different color combinations to get ideas and inspiration. You can paint bedrooms, living areas, bathrooms, corridors and exteriors. 10) Pittsburgh Paints Virtually Paint a Room Tool – The website of Pittsburgh Paints has a tool called Virtually Paint a Room which helps you select the colors that you might want to use in your next home decorating project. There are two ways you can choose paint colors, either you can browse from existing collections or you can pull out colors from a photo and use them in your project. This tool allows you to apply color and paint either preloaded sample photos or uploaded photo’s of your own room. For more ideas for color matching on the pc or mobile device visit our best paint color app page here. To try out different colors in your own layout visit our best interior design software page.